Thanks to Rich and the HTMC! What a great meeting and party! Thanks to Rich and to the HTMC for loaning us their fabulous clubhouse! 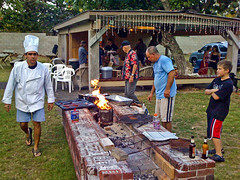 And thanks to Peter and Ray for cooking all night, and to Reaper for bringing the extra grill, and to Bob for bringing the bocce balls. Finally, thanks to everyone for coming, and for sharing your fine food and libations for the feast. Next time let's start earlier and play some volleyball! Great meeting! And great new venue! Here are a few of the pics I snapped to document the night! 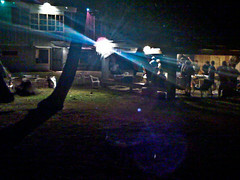 Thanks to Rich for the venue, Peter for the cooking and Alex, Bob and Ray for the words. And everyone else for the company! Thanks to Rich for the new venue. It was great fun had by all. Thanks to Pete, Ray and Bob for maning the grill and cooking. It was nice to have the night off :). Nice thanks for the pics. Thanx everyone for an awesome meeting/party. Many hands made light work. Great food, talk, beverages, beverage glasses; all made an effort with no complaints. Hawaii Paragliding association- NO KA OI!!! Thanks for the GREAT response to the HPA Beer Glasses!!! We sold EXACTLY enough to recoop our initial expense. THEREFORE . . . any further sales will be ALL donated to the HPA. We have several glasses left if anyone is interested. Additionally . . . if people want more . . . we can order at anytime.